Students watch Amen Dunes perform at Philfest. Philfest is an annual outdoor benefit concert held in honor of Phil Semmer, a former SEED member who died in 2000. Philfest, an annual outdoor benefit concert on campus, featured folk artists Amen Dunes and Lisa/Liza on Monday. The event, co-produced by A&O Productions and SEED, is held in honor of former SEED member Phil Semmer, who died in 2000. Semmer was a fan of bluegrass and folk-style music, and in his memory, SEED and A&O produced an outdoor concert featuring the style of music he appreciated, A&O co-chair Louisa Wyatt said. 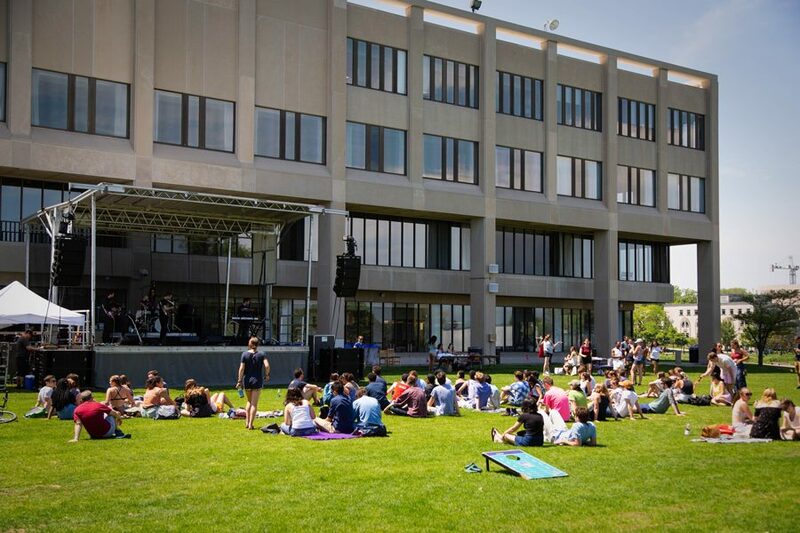 “It’s kind of meant to be a really nice, chill space for people to eat chips and guac and tie-dye T-shirts and just enjoy the sun and be together, and the music compliments that vibe really well, with both acts,” the Medill senior said. The show was headlined by Amen Dunes, an indie folk-rock band. Lisa/Liza, a psych-folk project fronted by singer-songwriter Liza Victoria, opened the event. Wyatt said both acts were A&O’s first choices for the concert. Amen Dunes frontman Damon McMahon said during the headlining performance that the set was the group’s first job after a tour with the band Fleet Foxes. He also said the band, which recently released its fifth album, “Freedom,” looks ahead to performing in Chicago soon. During Lisa/Liza’s performance, Victoria thanked the audience for being welcoming and supportive. She said she’s a fan of Amen Dunes herself and was excited to see them perform, also mentioning her 2016 debut title, “Deserts of Youth,” which she sold copies of after the set. Victoria told The Daily she enjoyed performing at Philfest because of the great audience and the beautiful area next to the Lakefill that the concert was held in. On another note, she said she loves folk music for its ability to convey emotions and connect artists to those listening.